Rumi Vesselinova, "Smoke and Kite," 2011, archival pigment print on cotton rag paper, 10 x 20"
“Such a beautiful-untouched lonely feeling place,” wrote Georgia O’Keeffe of New Mexico in 1943. “Such a fine part of what I call the ‘faraway.’” O’Keeffe’s New Mexico landscape paintings conjure a somber, solitary feeling, but her expanses are also serene, like deep yogic breaths. In contrast, photographer Rumi Vesselinova’s exhibition "Sketches in Charcoal and Fire" offers a dark twist on the “faraway." Vesselinova chronicles the chaos and aftermath of the 2011 Las Conchas wildfire near Los Alamos, which killed a record-breaking 150,000 acres of New Mexico forest. In a series of digital prints titled "Sketches in Charcoal," blackened trees pierce rolling hillsides like porcupine needles on rough scar tissue. The empty earth between and beyond these creaking corpses has a desolate quality that’s worlds away from the shimmering sprawl of your typical high desert vista. Don’t mistake Vesselinova for a journalist or ecological activist, though. She's spent years photographing the Southwest, and this ashen landscape — inextricable as it is from great tragedy — presents a new aesthetic challenge. Vesselinova subtly softened and desaturated the images, flattening trunks and branches into calligraphic brushstrokes that form dense patterns. One set of photos tightly frames horizonless passages of forest that could pass for abstract paintings. An earlier digital portfolio called "Sketches in Fire" serves as a colorful prologue to this severity. 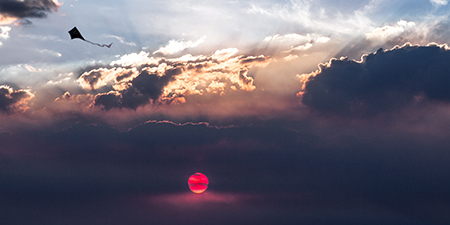 Captured from Santa Fe in the six weeks that the fire raged, it shows blood red sunsets and thick blankets of smoke over the Jemez Mountains. O’Keeffe’s “untouched" paradise is obscured and tainted, but Vesselinova has found a new variety of enchantment in this post-apocalyptic realm.